May 21, 2012 - Hamilton School District. The Hamilton School Board gave its approval to the 2012-13 budget that will be presented to voters at the June 18 Annual Meeting. The budget is $49.1 million, which is a 1.66 percent increase over the current budget, but still 2.13 percent less than the one two years ago. The district expects to lose another two percent in state aid, which shifts a greater share of revenue onto the local property tax levy. The tax rate is expected to be $10.41 per $1,000 of equalized property value. This is an increase of 28 cents per $1,000 of value. School Board members also approved the Annual Meeting agenda which includes a resolution seeking to permanently transfer .01 acres of district property along Silver Spring Drive to Waukesha County for road construction and .39 acres for temporary easement to provide construction access. Residents can learn more about the Hamilton School District budget June 18 beginning at 6:15 p.m. with the Budget Hearing in the Hamilton Fine Arts Center, W220 N6151 Town Line Road, Sussex. The Annual Meeting will begin at 7:30 p.m. Residents vote on the tax levy at the Annual Meeting. The 2011-12 retirements of a dozen district employees were commemorated at the Hamilton School Board meeting. Combined, the employees provided 257 years of service to the district. School Board members read and approved commendations for each employee that reflected comments from supervisors and colleagues, and each retiree was given a retirement gift. Those at the recognition pictured with (from left) School Board President Gabe Kolesari and Superintendent Kathleen Cooke were Hamilton custodian Frederick Krull, Jr., district Buildings and Grounds Assistant Manager Steve Pehowski, Maple Avenue first grade teacher Jean Jackson, district Food Service Manager Judy Pinter, Templeton special education paraprofessional Sally Hanney, Woodside technology integration resource teacher Julie A. Smith and Woodside fourth grade teacher Beverly Konkol. Those unable to attend were Templeton sixth grade teacher Erin Heikkila, Woodside special education teacher Pamala Kursel, Willow Springs custodian Guilio Tanel, Templeton night foreman custodian Dennis Hoyt and Hamilton applied engineering and technology teacher Steven E. Campeau. The district’s Community Service Award was presented to Power Test. 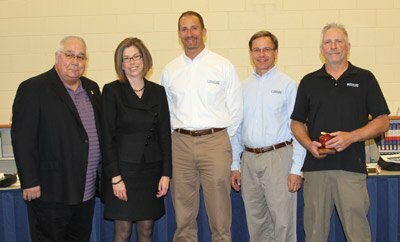 President Alan Petelinsek, Sales and Marketing Manager Todd Jerred and Production Manager Greg Johnson accepted the award. Superintendent Kathleen Cooke, Ph.D., said Power Test was chosen because it has been an outstanding partner. The company has provided input into the curriculum, served on the district’s Business Advisory Council, donated technical tools to the high school, provided student tours of the company and provided jobs for numerous Hamilton students. 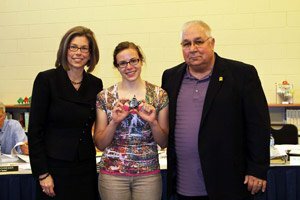 Hamilton senior Lydia Salus was recognized for her service to the School Board as the student representative during the 2011-12 school year, which was the third year that she held the position. Cooke, Ph.D., reported that thanks to feedback provided by employees, the Hamilton School District was among the best places to work in southeastern Wisconsin in “The Milwaukee Journal Sentinel Top Workplaces.” Hamilton was among the businesses and organizations named in a special section of the May 20 newspaper and online at www.jsonline.com. Evaluation for the Top Workplaces program is based on feedback from an anonymous employee survey conducted by an independent research firm. With 459 respondents to the survey, Hamilton had an outstanding 91 percent response rate among all employees. The School Board approved several documents including the Technology Literacy Plan, K-5 Science Curriculum, National Honor Society Handbook, Summer Workshop and District Professional Development Plan, Special Education Procedures Handbook, Emergency Nursing Services Policies and Procedures and Bloodborne Pathogens Procedures. increased the contracts of Hamilton speech pathologist Jennifer Knapp from 60 percent to full time and Hamilton French teacher Michael Tennessen from 50 to 67 percent.